It’s Sunday morning, and there’s no better reason to sleep in. With little to do this morning, and with breakfast being a quick and easy fix, why wake up and spend the time cooking? Yesterday, I made a batch of waffles while Steve fried up some bacon. We had plenty left over and we even reserved the pan the bacon was fried in so we could sauté some pears and apples in the leftover fond. 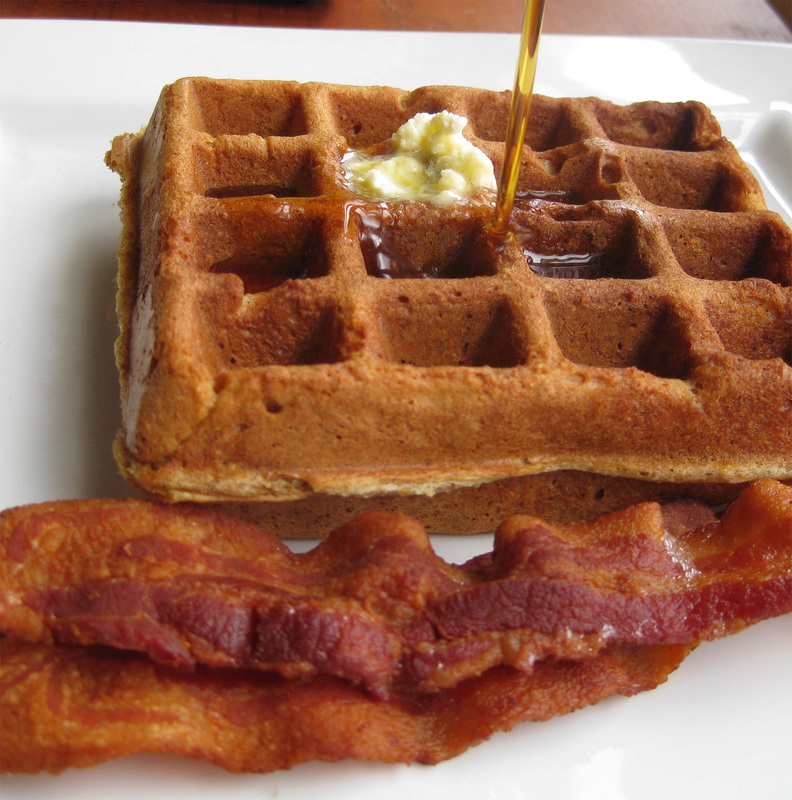 Our breakfast yesterday was a simple waffle and bacon with maple syrup. This morning though, we upped the ante for brunch with a sauté of apple and pear, a couple of waffles, crumbled bacon, with a drizzle of maple syrup and yogurt topped with blood orange segments on the side. It was such a feast we definitely needed to take a long walk in the park to work off some of the calories. I used Bittman’s quick buttermilk waffle recipe from How to Cook Everything, substituting ½ of the flour with whole wheat flour to make it a little healthy. Frying the bacon is a pretty easy thing to do. The only thing to remember is patience. You’ll want to render the bacon slowly so it doesn’t burn. A quick tip we picked up from America’s Test Kitchen is to roll each slice individually and then freeze the rolled slices for a latter use. This way you can purchase a large quantity of bacon and always have it on hand. If you own a microwave oven just pop a few slices in and defrost. If you’re like us, and don’t own one, just place the frozen bacon rolls in the pan on very low heat. As they defrost, unroll using two forks. It’s a bit time consuming but it’s well worth the effort. After the bacon is cooked, pour the grease in a small ceramic container for later use. Never pour hot grease in a plastic container. (It’s great to fry potatoes in, or sauté onions, or substitute the grease for anything that you would normally fry in butter.) Add a little butter to the pan and sauté a couple apples, pears, peaches, nectarines, or chopped pineapple (whatever fresh fruit is in season that goes well with bacon). 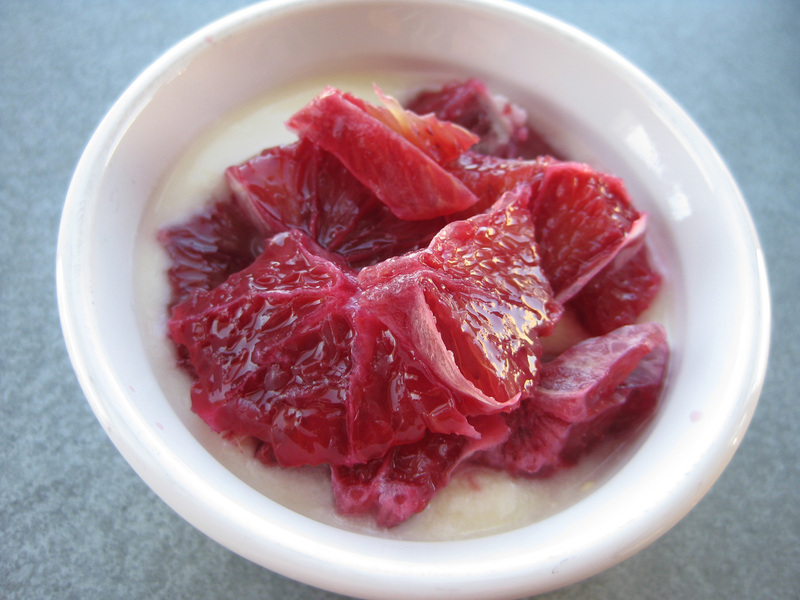 Allow the fruit to brown slightly and soften. Enjoy your breakfast with the Sunday paper and a cup of coffee. It’s Sunday after all and there’s no better day to relax and indulge. Preheat the waffle iron and brush lightly with oil. Combine all the dry ingredients. Mix together the buttermilk and egg yolks. Sir in the cooled butter and vanilla. Mix the wet ingredients with the dry ingredients. Whisk the egg whites to form soft peaks. Gently fold the egg whites, in two parts, into the waffle batter. Depending on the size of the waffles, use an ice cream scoop or ladle to add enough batter to fill the waffle maker, but not too much so that it oozes out the sides. Cook for 3-5 minutes and keep the waffles warm in the oven. The waffles can also be cooked, cooled, and frozen for a quick and easy breakfast any day of the week.